Mounted on an approx. 2-inch long (5cm) large, curved, removable alligator-style clip. A whimsical statement for any tree, this lovely red bird adds a chirping touch to your Christmas decor! Plastic birds have attached metal clips to mount almost anywhere. Each has a motion sensor that activates the bird's tweeting chirping sound when any motion is detected nearby. 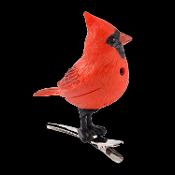 Each motion sensor chirping bird ornament clip is plastic, approx 3.25-inch (8.13cm) long x 1.5-inch (3.75cm) wide x 3-inch (7.5cm) tall. Can also clip to car visors, house plants, curtains, drapes, hats, caps, almost anywhere! *2- ''LR41'' 1.5 Volt round wristwatch-type alkaline batteries, INCLUDED. What a fun gift idea for both young and old!